The Leatherman MUT is the first multi-tool that functions as a tactical and practical tool for military, LE, or civilian shooters. The MUT features multiple areas on the tool threaded for cleaning rods and brushes and all the screwdriver bits are sized for standard military and civilian sighting adjustment work. Also built into the design of the tool is the flexibility to replace the most commonly used parts on the spot, using a simple Torx #8, keeping down-time to a minimum. With all this, a MOLLE sheath and scope adjustment wrench included, the Leatherman MUT may very well be the most efficient and useful piece in your kit. 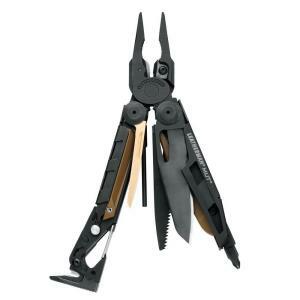 Tbook.com crawls the web to find the best prices and availability on Leatherman and related Tools and Hardware products like Leatherman Tool Group MUT 16 Black Tactical Military Multi-Tool with 3 Bits. For this page, related items include products we find that match the following keywords: "Leatherman" at our vendor partner Home Depot. Leatherman Tool Group MUT 16 Black Tactical Military Multi-Tool with 3 Bits is one of 14 Leatherman and related products listed in the Tools and Hardware section of Tbook.com If you have any questions on this product, please give us a call at 734-971-1210 during the hours of 9am - 5pm EST for assistance. Thank you for shopping at Tbook.com, the Internet Department Store!